Heat a heavy nonstick skillet over medium-high heat. While pan heats, rinse any ice glaze from frozen Alaska Pollock fillets under cold water; pat dry with paper towel. Brush both sides of fillets with oil. Place fillets in heated pan and cook, uncovered, about 3 minutes, until browned. Shake pan occasionally to keep fish from sticking. Turn fillets over and season with salt and pepper. Cover pan tightly and reduce heat to medium. Cook an additional 2 to 5 minutes or just until fish is opaque throughout. Remove fillets from skillet; keep warm. Wipe out pan, if necessary. Add walnuts to skillet; cook until walnuts are lightly toasted, shaking pan occasionally to prevent walnuts from burning. Add remaining ingredients and heat through. Spoon sauce over fish to serve. 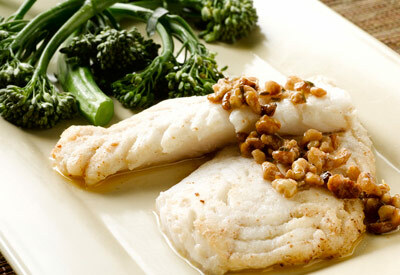 Alaska Cod or Sole fillets can also be used. Adjust cook time for larger cod fillets.